p53 human SimpleStep ELISA® (Enzyme-Linked Immunosorbent Assay) in vitro kit (ab171571) is designed for the accurate quantitative measurement of p53 protein in human cell samples. The SimpleStep ELISA® employs an affinity tag labeled capture antibody and a reporter conjugated detector antibody which immunocapture the sample analyte in solution. This entire complex (capture antibody/analyte/detector antibody) is in turn immobilized via immunoaffinity of an anti-tag antibody coating the well. To perform the assay, samples or standards are added to the wells, followed by the antibody mix. After incubation, the wells are washed to remove unbound material. TMB substrate is added and during incubation is catalyzed by HRP, generating blue coloration. This reaction is then stopped by addition of Stop Solution completing any color change from blue to yellow. Signal is generated proportionally to the amount of bound analyte and the intensity is measured at 450 nm.Optionally,instead of the endpoint reading, development of TMB can be recorded kinetically at 600 nm. The p53 protein is found in increased amounts in a wide variety of transformed cells. p53 is mutated or inactivated in about 60% of cancers. Four types of cancers account for 80% of tumors occurring in TP53 germline mutation carriers: breast cancers, soft tissue and bone sarcomas, brain tumors (astrocytomas) and adrenocortical carcinomas. 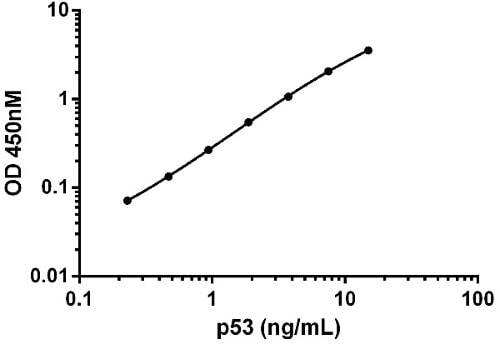 p53 levels are kept low through a continuous degradation of p53. Mdm2 binds to p53, preventing its action and transports it from the nucleus to the cytosol. Mdm2 also acts as ubiquitin ligase and covalently attaches ubiquitin to p53 and thus marks p53 for degradation by the proteasome. The ubiquitin can be cleaved by USP7 (or HAUSP), thereby protecting it from this proteasome dependent degradation. This is one means by which p53 is stabilized in response to oncogenic insults. Phosphorylation of the N-terminal end of p53, and conformational changes to p53, disrupt Mdm2-binding leading to p53 accumulation. Acetylation of the C-terminal end of p53 exposes the DNA binding domain of p53, allowing it to activate or repress specific genes. Deacetylase enzymes, such as Sirt1 and Sirt7, can deacetylate p53, leading to an inhibition of apoptosis. Our Abpromise guarantee covers the use of ab171571 in the following tested applications. Background subtracted data from duplicate measurements are plotted. 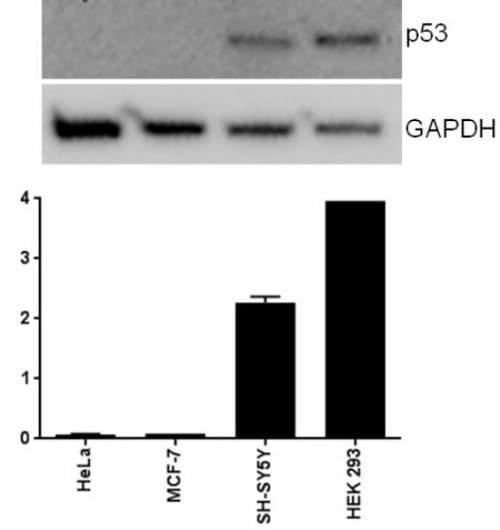 Note the relative lower expression of p53 in the MCF7, HeLa and HL60 cell lines compared to HEK293 and SH-SY5Y. ELISA (barchart) and western blot (top). Raw OD450 nm data from duplicate measurements for the indicated cells lines is shown (20 µg lysate analyzed). 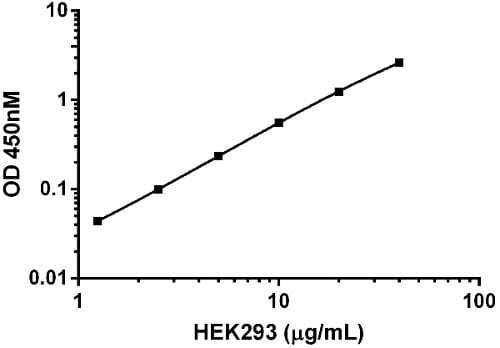 The p53 capture antibody was used to blot the same lysates as analyzed by ELISA (20 µg loaded/lane). The GAPDH blot is included to show the relative loads of each lysate. ab171571 has not yet been referenced specifically in any publications. Publishing research using ab171571? Please let us know so that we can cite the reference in this datasheet. Hi, I have noticed that in the protocol for the SimpleSet ELISA kit for p53 in the step: 11.2 Preparation of extracts from adherent cells by direct lysis You recommend solubilizing the cells by addition of chilled 1X Cell Extraction Buffer PTR directly to a 15 cm diameter plate. Would I be able to scale the volume of lysis buffer down to a 96 well plate format? This could then be transfered into the 96 well ELISA plate directly? Also why is there a need to scrape the cells afterwards? I have noticed that in kits for other targets (such as pAKT473) this step is not necessary. Can this kit be used with cell lysates (similarly to other kits such as the pAKT473)? Similarly to the AKT protocol, for the p53 kit, 96WP samples can be processed. If this is the case, 0.1mL is an appropriate starting volume for lysing cells in a microplate. Extracts should be pipetted up/down several times to fully solubilize. The main caution to take is to make certain that you can achieve a workable concentration of extract from the 96WP. Please have a look at Figures 2 &3 in the p53 Simple Step ELISA booklet (ab171571, page 20) as guidance for concentrations to be within the working range of the assay for some example cell lines. 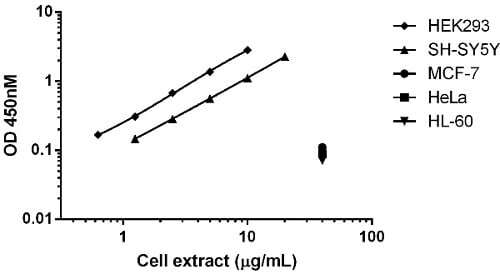 I would recommend running a pilot experiment to determine what concentrations can be achieved for your given cell line and culture conditions – the results should then dictate the lysis volume and if the extract needs to be further diluted in extraction buffer before adding to the ELISA plate. We think scraping increases the recovery of extract on large plates but it is not strictly necessary (and of course is impossible in 96WP). It is also advisable to take care in washing cells in PBS if the treatment or culture conditions have caused any cells to become loosely attached. You may also want to consider normalizing extract loads to the ELISA plate (e.g. by BCA assay) if the treatments are causing an effect on cell number. Note that 50uL of sample always needs to be added to the SSE plate.